The efficiency of strengthening of unreinforced hollow clay block masonry buildings with fibre reinforced mortar coatings has been investigated. A full scale three-storey building model and a series of accompanying walls have been built and tested. Reference unstrengthened, and strengthened specimens of each type have been tested by subjecting them to cyclic shear at constant compressive load. First, the three-storey model was tested in its original state until the maximum resistance was attained and major, but still repairable damage, developed in the walls. Then, the damaged model was strengthened with fabric reinforced cementitious mortar coating and re-tested up to near collapse limit state. Typical storey mechanism was observed in original and strengthened state, with the majority of damage concentrated in the walls of the bottom storey. Diagonally oriented shear cracks prevailed in the elements in the direction of loading. The behaviour of single walls in cyclic shear tests was similar to that observed in the piers of the building models. The analysis of test results indicated that the resistance and displacement capacity of unreinforced masonry structures of the particular type tested can be significantly improved if delamination and separation of coating is prevented. 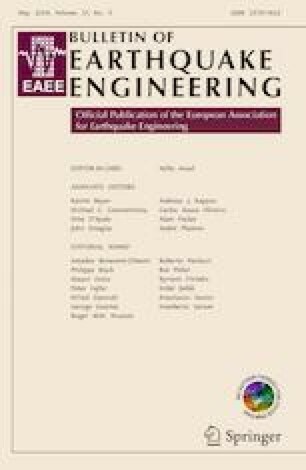 Finally, a calculation model for the assessment of seismic resistance of reference and strengthened building model is presented and the comparison between calculated and experimental results discussed. The research presented in this article was carried out within the research projects J2-6749 and ARRS-MR-496, financed by Slovenian Research Agency.